Well 2008 Olympics, and I have enjoyed it quite a bit. I really enjoyed the opening ceremony, and it was a great chance to use the PVR to record the whole thing. Walking race – really how is this a sport, it’s so contrived, ‘lets run, but without running‘. I mean you walk when you don’t want to run, or you run when your late and have a need to get there faster. So running races are about going as fast as you can, yet the walk (I don’t want to go fast) race, is about going as fast as you can without going fast, how can that be a race. Womans beach volleyball – lets get a great team sport, and empty the court of most of the players so that points are easy to get. Oh and now lets skimp the togs down so people watch. Um, if the people are not watching it’s because it’s boring. So tarting it up means only oglers will watch – is that what the Olympics is about, perving? My other major gripe I have is with sports that could be defined as a ‘game’. Football, Baseball, Softball and Tennis are not really higher, longer, faster are they. Ok, there are some team games I do like, but would be willing to loose, Volleyball, Table Tenis. I just don’t see ‘games’ as personal excellence. My last gripe, is that TV One had four TV streams available on-line, but our Internet plan charges for traffic because ‘international traffic is expensive‘ yet local traffic also gets billed at these rates, because ISPs can. Nice one ISPs. We have just ended a three month free trial with DVD Unlimited, and we will not continue with their service. We got the trial as part of buying our TV, so it did not hurt us to try. I didn’t like their terms and conditions, one of which includes that you are not allowed to link to them. Fine no Google juice for you! “NAME_OF_MOVIE was awesome, don’t you think? Cost: $84 > Value: $60, so even if I’m generous and cost each DVD at $2 each + pp ($2), that brings the value to $80, which still below cost. 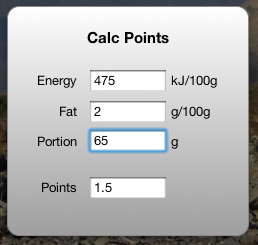 I have now made my Mac Calc Points widget available. The widget is used for calculating the ‘points’ for food, based on the kilojoules, saturated fat, and serving size on the food packet. You can choose kilo-calories or kilo-joules, measurements ‘per 100g’ or ‘per serving’, and the calculations based on constant numbers that are used in New Zealand or those suggested on Wikipedia. To change the options, just click on the i in the bottom right corner. Michaela and I have just finished watching Sicko, fantastic movie/documentry, that I’d been keen to watch for a while. Nic has an even better write-up so just read his (in full). It has made me hesitant about working in the US, it seems illogical to go somewhere so messed up. In fact I feel not so bullet-proof about my pending trip there. I guess I’ll take it a day at atime, and hope for good luck, just like 30 million Americans.